Sermon for Epiphany 7: "Command and Promise"
Command and Promise. God’s Word to Israel. God’s Word to his disciples. God’s Word to us. Christ speaks to all of us in command and promise. And if we get that, Jesus’ Words about loving your enemies and giving sacrificially to your neighbor make a bit more sense. Command and Promise. Command and Promise. This is how our Lord speaks to us. This is how he exposes our unholiness of sin and death and gives us His holiness of life and salvation. We heard it again today. You therefore must be perfect, as your heavenly Father is perfect. When it comes to holiness, the Lord has the corner on the market. Only the Lord is intrinsically holy, Like we confess in the Lord’s Prayer. Hallowed be Thy name. God’s name is certainly holy in and of himself but we pray that his name would be hallowed among us. And so we also sing our confession of the Lord’s holiness. We sang it just this morning in the Gloria. For You alone are the holy one. You alone are the Lord. You alone are the Most High Jesus Christ, with the Holy Spirit, in the glory of God the Father. Amen.” Try counting how many places the word holy is in the liturgy…you’ll be busy! What is holiness? Holy is separated, consecrated, set aside by the Lord. It also means perfect. And so, Jesus’ command couldn’t be any clearer. Be perfect. No moral or spiritual deficiencies. No measuring your perfection against your neighbors’. There’s only one standard of holiness – not yours, not mine, but the Lord’s holiness. Be perfect…As your Father in heaven is perfect. We can’t hide behind the old excuse, “Well, no one’s perfect.” Be perfect, Jesus says. Not average. Not good enough. Not trying your hardest. When it comes to God’s commands there is only do or do not. There is no try. The command is clear: Perfection. Completion. Holiness. And this makes our predicament all the more clear. Apart from Christ, we’re nowhere near perfection. In fact it’s quite the opposite: we’re broken. Imperfect. The Biblical word for this is Sin. Unholy. Only Jesus is holy. And sinners are unholy. The two can’t mix, like people and electricity. We’re not safe in the presence of God’s holiness. At least not without a mediator, not without a proper means of receiving God’s holiness. Just like you have power lines and outlets to properly administer electricity. This is what the Old Testament tabernacle and temple were all about: a place and means for God to give his holiness to his people and do away with their sin without doing away with the sinner. For though God’s holiness is not safe, He is good. He provided the sacrifices for his people. He provided atonement for their sins. He gave them his holiness. And so he does for us. What our Lord commands, He gives. The holiness His law requires He credits to your account. The perfection he demands, He supplies – and abundantly so. Holiness in the Old and New Testament is not about human accomplishment. Holiness is never achieved; it is received. Holiness is a gift from the One who is holy to us who are not. Holiness is shared with us. Given to us. Declared of us. It is the complete opposite of what we expect and what we deserve, but this is how the Lord works. Remember…Command and Promise. The same is true when Jesus speaks in today’s Gospel. His words are unexpected, outrageous even. But full of that same command and promise. “You’ve heard it said, ‘Love your neighbor, hate your enemy.” “But I say to you love your enemies, pray for those who persecute you, so that you may be sons of your Father who is in heaven.” Sons are called to reflect their father. So it is with our heavenly Father and His only Son, our Lord. Our Father loves His enemies and does good to those who hate Him. He causes His rain to fall on the just and the unjust alike. There are no little local showers over the good people. There are no local rains and bits of sunshine for the religious people. Everyone gets the same rain, the same sunshine. The same Jesus. The same command and promise. Behold what manner of love the Father has given unto us. That while we were yet enemies, sinners Christ died for us. Enemies. That’s what Sin made us – enemies of God. If God were to love His neighbor and hate His enemy, then it would simply be Father, Son, and Holy Spirit and no one else. A closed community of Three. God loved the world. God loved His enemies. He sent His Son Jesus. He was slapped and offered the other cheek. He was forced to go one mile and went all the way to the cross. They stripped him of his cloak and his seamless robe. He gave to all who asked of Him. He prayed for His persecutors – “Father, forgive them, they don’t know what they are doing.” He did it as the only-begotten Son of the Father so that you might become sons of your Father who is in heaven. Christ did it to completion, and when it was completed He said so. It is finished. Tetelesthai is the Greek word. It means complete; accomplished, fulfilled, finished. It’s the same word Jesus uses in Matthew: “You will be complete, whole. Teleios. As your Father in heaven is teleios, complete. So if you’re looking to yourself for holiness you’re looking in the wrong place. There on the cross is your holiness. There in Jesus’ death is your perfection. There, in the crimson streams flowing from his hands and side and head, is your completion. It is finished. Complete. Holy. Perfect. All for you. Jesus, the Most Holy One comes right into our lives, interrupts our busy schedules, and takes all our rotten, stinking, unholiness – our sin – in His body. He carries it all to the cross. Dies for you. Becomes unholy and imperfect and broken for you. And in exchange He bestows His holiness to us sinners in His Spirit-filled Word, Baptism, and Supper. That’s why water and blood gush from His side at Calvary. Water – Holy Baptism. Blood - Holy Supper. 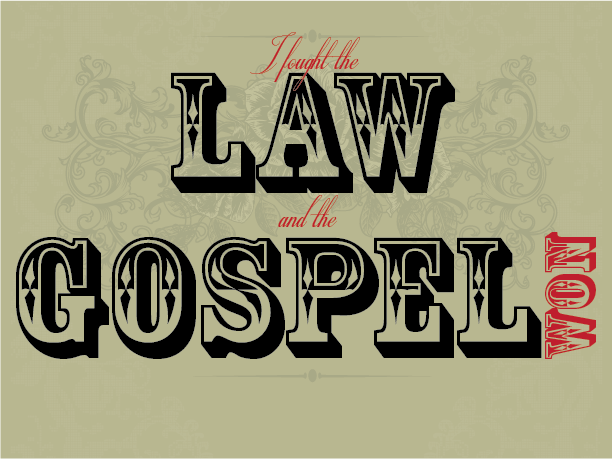 The means by which the Spirit bestows Christ’s holiness. Here you are covered with Christ’s perfection. Here the Lord shares his holiness with you. Because if Jesus’ command is clear, His promise is even clearer. You will be perfect, complete, whole, entire as your Father in heaven is perfect, not because of something you’ve done, but because of everything that Jesus has done for you. Not by the holiness of your life for God, but by His perfect life lived in your place. Not by your perfect living out the Law, but by His becoming Sin for you, by His death on the cross, by His resurrection and ascension, and by the outpouring of His Spirit upon you in Baptism. You are holy. And more than that you are God’s temple, you have the Holy Spirit, Paul says. For God’s temple is holy, and you are that temple. It’s all in Jesus’ words of command and promise. J.R.R. Tolkien was not fond of potential biographical accounts concerning his life and experience, or literary critiques based on an author's personality, family life, place of birth and so forth. The same was true for his friend and colleague, C.S. Lewis. Together, these men shared the great intellectual and literary insight that the best way to get to know an author is not primarily by reading his or her biographical works - those of a secondary nature -but through the primary sources of the written by the author. It's a good practice in history, literary analysis, and theology, just to name a few disciplines: what does the primary source say? Deal with the primary text first before moving on to secondary sources, biographies, commentaries, and the like. For these two literary giants the key to their literary insights was to pick up a book and listen to the author's own words. So, the best biography available on Lewis or Tolkien their respective literary output. (Of course, neither men entirely dismissed biography and neither should those who read, mark, and study their work. After all, there are several excellent biographical works written about Lewis and Tolkien.) One of the greatest biographies on Tolkien you can read is Lord of the Rings and The Hobbit. 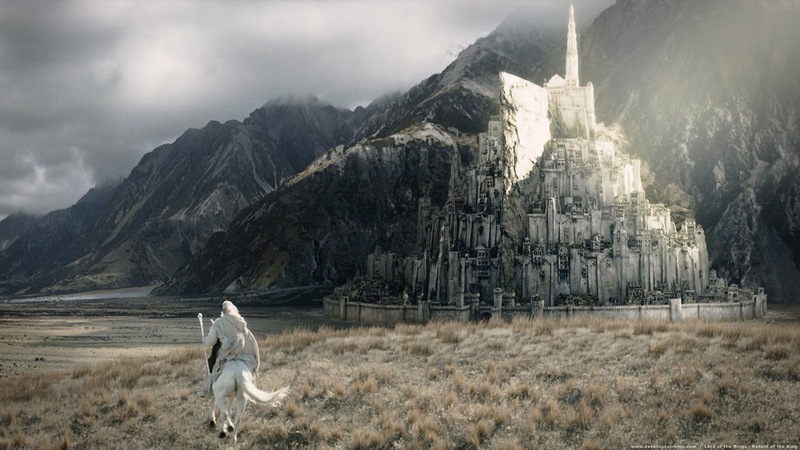 In a letter dated December 2, 1953 Tolkien replies to a close friend of the Tolkien family, Father Robert Murray, after he had read typescripts and proofs of The Lord of the Rings and had inquired about Galadriel paralleling the Virgin Mary. Tolkien affirms this and goes on to make one of his more remarkably lucid statements on the presence of Christian symbolism (not allegory) in his writings. I know exactly what you mean by the order of Grace; and of course your reference to Our Lady, upon which all my perception of beauty both in majesty and simplicity is founded. The Lord of the Rings is of course a fundamentally religious and Catholic work; unconsciously so at first, but consciously in the revision. That is why I have not put in, or have cut out, practically all references to anything like 'religion', to cults or practices, in the imaginary world. For the religious element is absorbed into the story and the symbolism. However, that is clumsily put, and sounds more self-important than I feel. For as a matter of fact, I have consciously planned very little; and should chiefly be grateful for having been brought up (since I was eight) in a Faith that has nourished me and taught all the little that I know; and that I owe to my mother, who clung to her conversion and died young, largely through the hardships of poverty resulting from it. J.R.R. Tolkien, Letters, ed. Humphrey Carpenter, Letter 142, p. 172. With the recent theatrical re-release of Disney's Frozen the sing-along version came a resurgence in exploration of the movie's themes and possible connections to the Christian faith. Some of the producers working with the film have even acknowledged the presence of Christian themes in the movie, calling them more subtle than overt. So, this last Monday I was glad to join Rod Zwonitzer on KFUO's Cross Defense, to discuss some of the implicit and explicit Christian themes in the movie Frozen. Here's the link if you want to listen to the program on KFUO's on demand archive. If you've seen the movie and have any comments relating to this discussion, feel free and post them in the comment thread below. Also, I've posted some of my thoughts below which I had summarized for our local newspaper here in Huntington Beach, CA. This is a good, albeit brief, example of apologetics for the tender-minded, using things like art, movies, literature, or music to give people a glimpse of the one true story, the Grand Miracle of Christ's incarnation, life, death, and resurrection. Caution! This movie review contains spoilers! Frozen was one of those rare cases where the movie was better than the book. Frozen was (loosely) based upon The Snow Queen by Hans Christian Anderson. However, the portions of the story that bore resemblance to the original fairy tale were a few names, and the words "snow" and "queen.” But I’m glad Disney departed from the original because they made it a better story in the end. At its heart, Frozen is about love and sacrifice. In the beginning of the movie we find a royal family with two daughters, Elsa and Anna. Elsa has a gift. She can magically summon snow and ice. However, she discovers that her gift can be a blessing or a curse. Later in the course of the film, we find out that only an act of true love can break the curse which had spread. At Elsa's coronation the gates of Arendelle were open for the first time in years but there was trouble. Elsa's icy powers came unleashed and Arendelle was frozen in an eternal winter. Elsa fled her home to the Northern Mountain to live in isolation. The naturally, adventurous and impetuously optimistic Anna went after her. Meanwhile the whole land awaited an act of true love to break the curse. Thankfully, that act of true love came. But it did not come as expected. The prince, Hans turned out to be a snake-tongued, two-faced, power-hungry boy who manipulated Anna's innocent love. Kristoff, the hard-working, rough and tumbled ice-block salesman was the underdog in the running to save Arendelle from the curse of an eternal winter. Eventually, Hans was discovered for a fool. Kristoff and Anna fell in love. But it was Anna who was the surpise Christ-figure of Frozen. As Hans stood over Elsa with sword in hand, ready to strike the fatal blow, Anna threw herself in front of her sister. She placed her frozen, dying body between Hans’ sword and Elsa. The frostbitten curse got her just in time for the sword to fall upon her frozen hand. It was a self-sacrificing love. What a marvelous picture of Christianity. Jesus stood between us and death and took death's blow for us, all the way to the hilt. Jesus placed his dying body between us and the grave. Self-giving, self-sacrificing love. Jesus placed all others before himself. But Jesus didn't stay dead. Jesus is risen from the dead. Sin's frozen gloom over us is melted. Death's cold, icy grip on us is shattered by the warmth of Jesus’ resurrection. On Monday, February 3rd, I had the joy and honor to be give a lecture for the theology students at Concordia University in Irvine, CA. In many ways, returning to campus there is a bit like returning to a family summer home. It was there in Irvine where I received a thoroughly necessary re-introduction to the Lutheran confessions. I also sat at the feet of one of the greatest apologists and theologians of our time, Rod Rosenbladt, whom I now consider both a colleague and a friend (and a man for whom I am greatly thankful). The Eagle Eyrie, as I sometimes affectionately call it was also the nest where I met my beloved wife, Natasha. So, for these reasons, and many more, I always enjoy stepping foot back on campus. This particular time I had the added joy of presenting a lecture on the intersection of two of my favorite topics: Christianity and Literature, specifically in the works of J.R.R. Tolkien. I've entitled it Faith and Fairy Tales for the very specific reason that Tolkien addresses and teaches us in his sublime essay "On Fairy Stories," namely, that Christianity is not only historically true (what he would say Primarily true or true in the Primary world), but it is also meaningful. Christianity is both historical fact (e.g. Christ's death and resurrection) and it is a well-told story. It is historical and verifiable and yet it does not cease to be a beautiful narrative. As Lewis once said, it is the one true myth because myth has become fact in Christ's incarnation. Thus, fairy stories (broadly speaking) can and should be expected to point us to the Gospel (the one great and true story of all). But these stories, as well told and enjoyable as they are, are not a replacement for the Gospel, simply a beautiful glimpse or a stab of joy that reflects the supreme joy of the Great Eucatastrophe: Christ's life, death, and resurrection. In other words, fairy stories (and literature in general, not to mention other arts, etc.) can point us to the Gospel, but they are not the Gospel. This distinction and tension must be maintained for both to be enjoyed properly. I've posted the slides below for your viewing. Keep in mind that much of the explanation for each slide is left to the verbal part of the presentation, which I hope to have up on this blog sometime soon in various audio formats. Most likely I'll use this presentation again, and like Tolkien to a degree, I will find myself editing and changing it; after all, good fairy stories (and discussions about them) never really come to an end. Additionally, I hope to write out a meatier outline, if not a full essay, based on the presentation below. But until then, I hope you enjoy Faith and Fairy Tales. 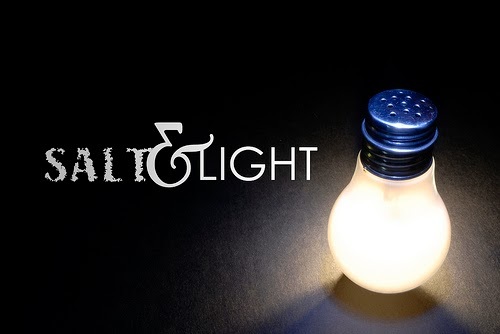 Sermon for Epiphany 5: "You are...Salt and Light"
You are salt. No doubt you’ve been called many things. Salt probably isn’t one of them. But it’s a good thing. In fact, it’s a blessing. Just like Jesus’ nine beatitudes in Matthew’s Gospel (just before this reading) where Jesus declare that you are blessed precisely because you have nothing to offer God, no claim to make…blessed are the poor in Spirit. That’s us: beggars, but blessed. You are salt. These days we’re cautious about salt. Low sodium diets. Doctors tell us to watch our salt consumption – and for good reason. There is such a thing as too much salt…just ask car owners in the Midwest. But salt also has many beneficial qualities about it too. If you’re stuck in on a snowy road, salt helps keep you out of the ditch. It’s good for flavoring and seasoning… like a quadruple venti salted caramel hot chocolate! And in Jesus’ day, salt preserved food from rotting. Salt was sprinkled in the sacrifices of the temple. Salt was even used to disinfect wounds and prevent diseases. You – Jesus’ disciples – are a preservative and a seasoning in a decaying, rotting world. This is who you are as God’s people. You are baptized. Your saltiness is not yours but Christ’s. He is what makes the disciple salty just. Without Jesus’ death and life, there is no salt in the disciple. And salt without saltiness is useless. You are also a light. A city set upon a hill. Now that metaphor is a bit easier to understand. Darkness means sin and death. You shine the light of Jesus’ death and resurrection into a world shrouded in death. Like salt, light makes a difference. It’s noticed. It’s hard to hide. A city set high on a hill that can be seen for miles around. Or like a lamp set a on a stand that fills the whole house with light. So too, Jesus says, “You are light.” Enlightened by the Spirit. That’s why at Holy Baptism we give a lit candle to the newly baptized. Receive this burning light to show that you have received Christ who is the light of the world. And so we live, reflecting Christ’s light in our daily lives. Again, this has little to do with any particular brilliance of your own. It’s not because you’ve cranked up the right wattage in your spiritual amperage or generated your own holy energy. Just as with the salt, you are light because Christ has declared: “You are the light of the world.” Christ’s death and resurrection shine forth from you in word and deed. It’s who you are. You are salt. You are light. To say you’re not is absurd. Like salt losing its saltiness or covering a light with a 5 gallon bucket in a dark room. This is a warning for Jesus’ disciples and us. Don’t lose your saltiness. Don’t cover up the light. Don’t stop being who I’ve called you to be. How does a disciple lose his saltiness? By fixing your eye on something other than Jesus, by trying to preserve a rotting world with something other than Christ Crucified and risen, by replacing the seasoning and light of the Gospel with whatever flavor of the week sinful people have cooked up. By justifying yourself and leaving out the cross and looking for another way to be, you know, “spiritual without being religious.” But spirituality without the death and resurrection of Jesus is like salt that has lost its bite. It’s absurd. Worthless. Fit for the garbage heap. That’s why your identity is not in how well we live out being salt and light. You’re identity is in Christ. Your faith is enlightened, created, and preserved by the salty, enlightening Word of Jesus. 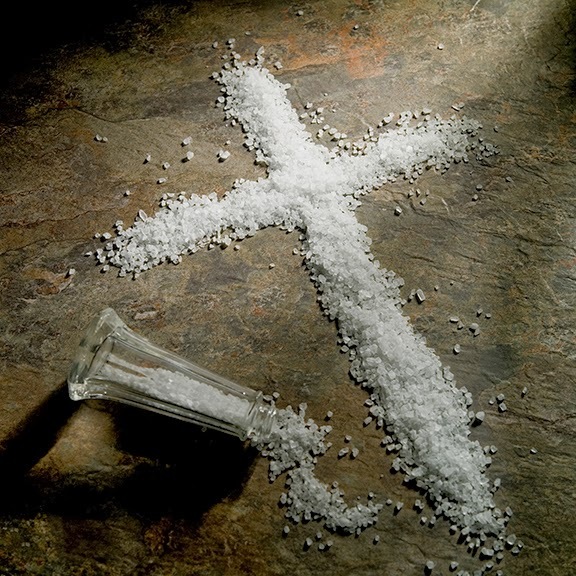 Words like he promises us in the beatitudes: “blessed are the poor in spirit – the ones who have nothing to offer God, who can make no claim on heaven – yours is the reign of heaven.” Words like he declares in today’s reading: You are salt. You are light. How are we, the Church a salt and light? By continuing to do doing what St. Paul and Isaiah did: preach Christ Crucified, and love the neighbor. “I decided to know nothing among you except Jesus Christ and him Crucified.” “And feeding the hungry, providing for the homeless, clothing the naked – caring for all,” says Isaiah. Or, as our sign and bulletin says: clear witness, caring service. But our being a salt and a light isn’t what preserves this congregation. It is Christ who is our salt and light. Jesus preserves his church with the salt of his Word in the absolution, as you are preserved in forgiveness by the Holy Spirit, Jesus’ Word and water in the font where Christ’s death and resurrection are sprinkled, no, poured out upon you preserving you from death and seasoning your life with Jesus’ death and resurrection, Jesus’ Word in the Holy Supper where his holy flesh preserves and rescues us from the stinking, rotting sinful flesh we carry around with us. And the same is true for Jesus’ other metaphor of light. The light the Church shines forth is the clear light of the Gospel: your sins are forgiven. Your dark deeds of sin are no match for the light of Christ. Christ has called you out of darkness into his marvelous, crucified, resurrected, and ascended light. Jesus is your salt: His life and death preserves you in life and death. Jesus is your light: His cross and resurrection, and sending of the Holy Spirit enlighten you in word, water, body and blood. The Church is salted by Christ to be a salt to this sinful, dying world; enlightened by Christ to be a beacon, a harbor, a herald of Good News. Through your sharing the Gospel and your life of mercy – the world sees the God who is merciful to sinners. …let your light shine before others…that they may see your good works and give glory to your Father who is in heaven. Notice Jesus doesn’t say your neighbors will see your good works and glorify you. But glorify your Father in heaven. If you’re doing good works for you, they’re not really good. And if you’re doing good works for God – well that’s not what Jesus is saying either. God doesn’t need your good works, but your neighbor does. Take evangelism for example…you don’t invite friends or neighbors to church to get on God’s good side (that’s what the Mormons and JW’s do); you do it because you love your neighbor, because you want to tell them Christ was Crucified for them. Or think about Christian stewardship…the money God has called us to care for, the time he has called us to service, the skills he has given each of us – these aren’t used selfishly, for our own personal purposes – but for the good of Christ’s Church, for the well-being of others. This is why Jesus came as pure salt to this earth. Why Jesus is Light of light, the true and only Light of the world. His righteousness exceeded that of the scribes and the Pharisees. His was the righteousness of God. He kept the Law perfectly. He fulfilled the word of the prophets down to the last stroke of the pen. His very own life and death is the preservative that salts this decaying, rotten, sinful world. The light of his glorious death and resurrection is the one true Light that pierces the night of sin and banishes the shadow of death. And it’s this light and salt that fills the life of the Church. You are a light, a city on a hill – just like Jesus was raised up on a hill to die, for the entire world to see their salvation in Jesus. You are the salt by which God preserves a rotting, dying, decaying world from judgment. In the book of Acts, Christ takes His church like a salt shaker and spreads out his disciples and his Word and Sacraments to the ends of the earth. It’s no different today. You are the salt of the earth and light of the world. That’s who you are in Christ. Wherever God has shaken you out – your home, your community, your work, your school – there you are salt, seasoning your little corner of the world with Jesus as one of His salty baptized believers. You are salt. You are light. For you are blessed, preserved, and saved in Jesus. Sermon for Purification of Mary and Presention of our Lord: "Consolation and Redemption"
Simeon’s song is a good reminder that in Christ’s Church, Christmas never really ends. Jesus is with his church – not in a touchy-feely, hallmark card kind of way. Jesus is with his church in his crucified, risen, and ascended presence, his very body and blood. This is why Divine Service isn’t about an emotionally meaningful worship experience (whatever that means) but about being gathered in Christ’s Church where the Lord of continues to be Servant of all. That’s why Simeon sang that day in the temple: in his arms he held the Savior, weak and lowly infant though He was. Consolation and Redemption was here…at last! That’s why today we’re celebrating the Festival of Mary’s Purification and the Presentation of Jesus in the temple. For we too, hold the Savior today: His forgiveness rests upon our ears. His Holy Supper upon our lips. And his praises spill forth from our mouths. In case you haven’t been keeping track, it’s 40 days after Christmas. That’s what the Law of Moses prescribed in Leviticus. 40 days after the first born male child is born, the presentation to the Lord for they are holy. set apart. That’s what Hannah was doing in 1 Samuel. That’s what brought Mary and Joseph to the temple. Jesus fulfilling the Law, even at 40 days old. 40 is a biblical number for a time of testing and fulfillment – a time when the Lord keeps his promises no matter how much it looks like he’s forgotten. 40 days and nights of rain in the great Flood. 40 years wandering in the wilderness after the Exodus. 40 days of Jesus being tempted and rebuking Satan in the wilderness on our behalf. 40 days between Jesus’ resurrection and His ascension. You could also say that 40 is a number of waiting in the Scriptures. Just like families wait 40 weeks for mothers to give birth to their children. And waiting always leads to consolation and redemption. That’s what Simeon and Anna were waiting for. Waiting…always comes before consolation. Noah and his family waited over a year to walk on the dry ground of a new creation. Israel waited over 40 years to finally cross the Jordan to the Promised Land. Simeon knew a thing or two about waiting. The Holy Spirit had revealed to Simeon that he would not see death until he had seen the Lord’s Christ. Imagine how many days he went to the temple: waiting, watching, thinking: “Is today the day?” until one day Mary, Joseph, and 40 day old Jesus walk into the temple, and the Holy Spirit says, “There He is, the Christ, YHWH’s promise in human flesh.” Simeon is the Old Testament in one man, watching for the fulfillment and consolation of Israel. That’s the pattern. Waiting, then consolation. What do you find yourself waiting for? Personally we might wait for a lot of things: Healing or test results for a loved one, employment or financial stability, an answer to a specific prayer. As a congregation we also wait: for that seed of faith to sprout and grow in our neighbor who’s heard the Gospel; for our friends or family members to take us upon our invitation to church; for our Lord to fulfill his promises just as he did for Simeon. In that respect, it is good to wait on the Lord. It’s even good to cry out with the Psalmist, “How long, O Lord?” (Psalm 13). Look at how Simeon spent his time waiting – in the temple. But it’s not always what we’re waiting for that’s the problem but how we’re waiting. Truth is, we’re all horrible at waiting. We’re perpetually, insufferably impatient. We’ve a hard enough time waiting for a stop light to change let alone waiting on the Lord. Impatience is just another mask of our old sinful flesh, wicked fruit from a rotten, dead, sinful tree. We’re impatient because we don’t trust. It’s true on a human level in our relationships with one another: after all, waiting means being dependent on someone else. Waiting means trusting another person. And it’s especially true on a spiritual level: waiting on the Lord means that we’re entirely dependent upon him. Waiting on the Lord means trusting his word, not ours. Repent. For God doesn’t operate according to our Google calendars or our iPhone alerts. Repent and live like Simeon; wait on the Lord. So, how does God answer us in our waiting? The same way he did with Simeon: in the hidden lowliness of the cross. In the ordinary humility of a defenseless, tiny child – probably the last thing Simeon expected. All of God’s promises wrapped up in the human flesh of a 40 day old infant in his arms. Simeon’s consolation and ours is found in the Child of the Manger. Simeon’s redemption and ours is found in the redemption of this Man on the cross. For the greatest sacrifices Mary and Joseph brought to the temple that day weren’t the turtle doves or pigeons, but the little child, Jesus. And Jesus is your consolation and redemption. Your consolation is in that 40-day old child, who fulfills and keeps the whole Law for you. Your consolation is in the fulfillment of Simeon’s words to Mary: “this child is appointed for the fall and rising of many in Israel.” Your consolation is in the fall, the death of your sin and the rising to new life in Baptism. Your consolation is found in the Lord of all who becomes the Servant of all, to redeem you and Simeon and a fallen world. Your redemption is in that child who grew into a Man, in order to go to the cross for you. Your redemption is in that Man whose blood sets us free from our impatient, sinful, self-loving ways. Your redemption is found in Jesus who perfectly fears, loves, and trusts the Heavenly Father, not for himself, but for you. So that your redemption is also found in the blood shed from the cross, poured out in the chalice for you; in his body broken in death for you. And that’s where we join in Simeon’s song. Simeon sang: “Lord, now your servant departs in peace.” Do you know what he’s saying there? He’s ready to die, free to die in the promises of Jesus. But don’t think that Simeon’s song is a dirge. It is a joyous song. Depart in peace, he sings. And so do we. Rejoice. Your life is hidden in Christ. Rejoice, your death is also in his hands. That’s why we sing Simeon’s song as we leave the Altar. There’s even an old saying in our Lutheran church, that, "We go to the Sacrament as though we were going to our death, so that we might go to our death as though going to the Sacrament" (Ken Korby). We’ve held Jesus in his flesh and blood, just like Simeon, only better. We’ve received his forgiveness and promise, just like Simeon, only better. We’ve worshiped the Child of the manger, the Man of the cross. We’ve seen Jesus; we’ve tasted his salvation; we have beheld His glory, hidden beneath word and water, bread and wine. And now we can truly depart in peace, according to God’s Word.